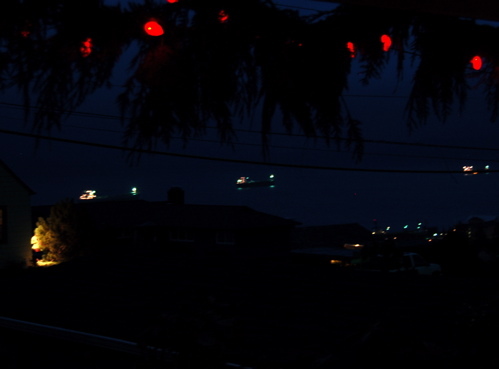 Night view of the Columbia from my be-garlanded porch. I’ve been very absent around here, because I’ve been so overwhelmed with this virus. I’ve been run down since Halloween and I finally succumbed last week. I’m starting to recover and I promise I’ll be back to blogging very soon. In the meantime, I thought I’d leave you with am example of what drug-induced dreaming looks like!Â IZ and I both are sick with this virus (I’m not saying how he got it, other than he was a willing participant and knew I was contagious going in! ), and being stuffed up means lots of snoring. Lots of snoring means Wende doesn’t sleep and is grumpier than usual. So, to combat the issue and attempt some sleep, I’ve been using those foamy orange earplugs to dampen the sound. Â One night, armed with earplugs and hopped up on cold medication I dreamed I was munching on grapes. Â I woke up with this terrible taste in my mouth, only to discover that in my sleep I’d actually put an ear-plug in my mouth. Â Feel free to laugh. Hard. We did. And then we coughed and blew our noses and laughed some more. See you tomorrow. Don’t eat your earplugs tonight. I did laugh. But in a sympathetic way. It could’ve been worse – you could’ve swallowed it. I’m wishing you all the health I can. Take it easy and get better! That’s just one more danger that earplugs present. (The first one is not hearing a serial killer sneak up behind you) My earplugs are purple, which is just one more reason this made me laugh. Oh no! I did laugh…but I hope I was laughing WITH you. I’m at least laughing with anyone else who read this post…Poor things. Heal fast! I where earplugs every night, and am always afraid that is going to happen to me!